I’m prompted to correct my impressions as much by Barry Schwabsky’s review in November’s Artforum (p 285-6) as changes in the work itself. He too seems a little wide of the mark. 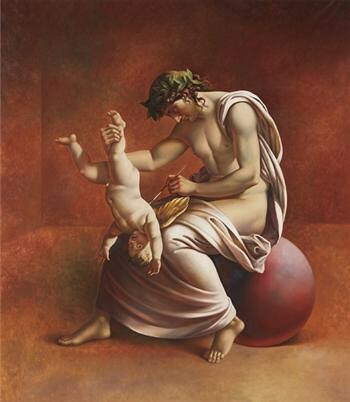 Schwabsky seizes upon the classicist or pre-modern allusions and supposes a familiar Po-Mo trope (irony, excess, decadence, etc) mainly derived from Italian painting of the 80s. That ignores a strong Photo-realist influence that ties figures to contemporary standards for physique or proportion as well as tonal integration with settings. Not for Bresson the studied reversion to Bolognese ideals or Mannerist exaggeration; his brawling gangs owe as much to the cinema as say, Poussin’s exacting compositions. Is this then just another instance of Anacronismo? 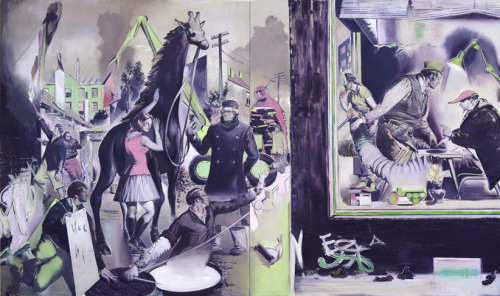 - The wilful introduction of contemporary subjects into an historical style or genre? If subjects were all that was at stake, one would agree. But where matters of lighting, proportion and the rigours of perspective substantially reform a pre-modern framing, we go beyond anachronism. 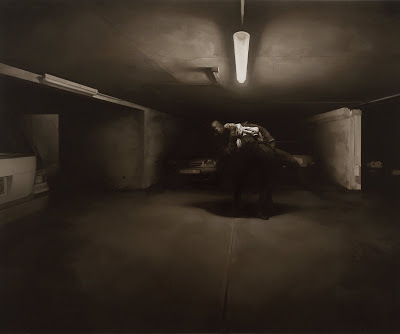 Then again, the use of grisaille or monochrome is hardly typical of Hypermannerism or Pittura Colta, much less the pre-modern, but is prominent in 80s work ranging from Mark Tansey to David Salle and Gerhard Richter, if we want to dwell on the 80s for precedents. But it is the lack of recent precedent in painting for Bresson’s violent encounters between youths that probably suggests the cinema or television to me. I’m stuck for prominent examples of gang rumbles in recent or even modern painting. Even when we broaden the category to warfare, I find myself reaching back to someone like Delacroix perhaps, whose facture did spring to mind in some of the earlier, freer examples by Bresson.